While Justice Link lawyer and executive director, Justice Dzonzi, has argued that Peter Mutharika’s candidacy can be challenged in a court of law and, thereby, rubbing Democratic Progressive Party die-hards the wrong way, some lawyers have contradicted him arguing that Dzonzi is just desperate to see Mutharika barred from standing for him to utter such remarks. Dzonzi has been quoted in the press today as saying that the holding of Mutharika’s Green Card can be a limiting factor for him to stand as a Presidential candidate as, according to him, it entails that he owes allegiance to another country which is not allowed in the constitution. Dzonzi said that his interpretation of the constitution’s Section 80 (7) (d) which says that no person shall be eligible for nomination as a candidate for nomination as a President or First Vice-President or for appointment as first vice-President or second-Vice President if that person owes an allegiance to a foreign country, is that it was illegal for Mutharika then to contest as he holds a green card. Dzonzi has argued that the fact that a Green card holder is required to pay taxes to the US, has to have a home in the US and in a year has to be in the US for 90 days is enough proof that a holder is one who owes allegiance to the US. However, some lawyers have faulted Dzonzi’s reasoning claiming a Green card is just a way of one having access to the US easily. Dismissing it on the issue of property ownership and paying taxes, they have argued that Mutharika is not the only one to have properties overseas and that cannot be a conclusive factor to say that one owes allegiance to a foreign country. “If paying tax is evidence of citizenship, are we trying to say that Professor Mutharika doesnot pay tax to Malawi Government? The Clinton Hunter Foundation pays tax to Malawi Government, so Bill Clinton is a Malawian. Alex Lijuni works and pays tax in South Africa, so he is not a Malawian. Bright Malopa pays tax to the South African government, and Mzondi Lungu pays his to the United Kingdom. And the chinese workers here are all malawians as long as they pay tax here,” argued lawyer, Bob Chimkango. 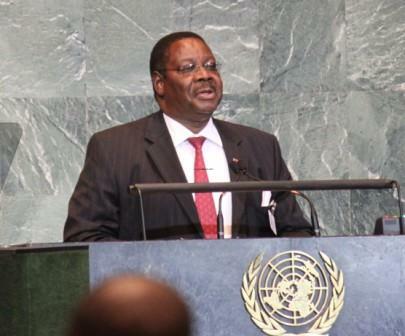 Peter Mutharika’s candidature has been under heavy controversy lately with many legal challenges appearing to be standing in his way. His party, the Democratic Progressive Party (DPP), has perceived this as persecution but has said that the party will sail through. Lawyers say these are technical terms. Pamenepo Peter would score 0.